Description: A Roadrailer approaches Kansas City near Birmingham MO. I didnt see these trains often, so this was a treat. Our Kansas City terminal was on this road, making train watching easy here. 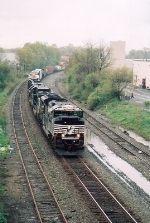 Description: NS 9389 is on the point of a unit coal train sitting by the remnants of Bethlehem Steel in Bethlehem, Pa 2/2003. Description: NS 13N proceeds towards the signal bridge on track 1. Description: 18N with a new SD70M-2 leading it east. Description: Starts into the Oak Tree Curve underneath the Park Ave overpass with a brand new 70M-2 in the lead. Description: 16N heads east on track 2 on the NS Chicago-Toledo Line. Description: An eastbound mixed freight in Cove. Description: my mom took this. that's why it's so blurry. Description: Behind the VFW, 0739 hours. Description: View from Amtrak P42DC 192 on the head end of train A-7-11, the westbound Empire Builder - BNSF Milk River Subdivision. Description: 3 C40-9W's lead 24Q towards Norfolk. Description: A train has left its siding and is passing this station. Title: WB Arriving at Gallup station. Description: Definitely jacket weather for my son & I! Title: BNSF 5410 side shot. Description: Standing on platform at Gallup station. WB crawling by to yard.